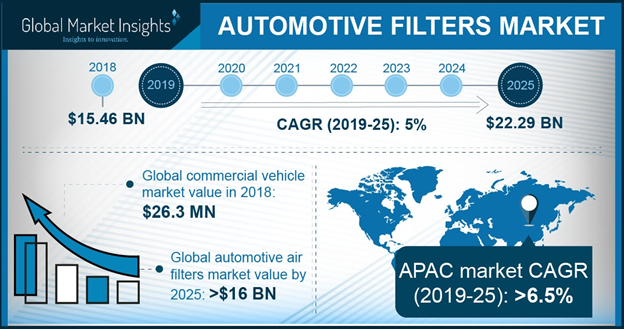 Automotive Filters Market size was over USD 5 billion in 2015, and is anticipated to grow at 8.4% CAGR from 2016 to 2023 to be valued at over USD 9.5 billion by 2023. Automotive filter aids in prolonging engine life as it efficiently traps debris and dirt that harms internal engine parts such as cylinders and pistons. Engine damage may occur even from a small particle of salt, which is likely to result in costly repairs. These devices enable appropriate air flow to the engine, thereby maintaining air-fuel mixture. They help enhance the emission control system and minimize spark plug ignition problems that can lead to severe drivability issues. Appropriate air flow facilitates the engine to function accurately, thus reducing emissions as well as fuel consumption. Environment hazards caused due to emission of harmful gases in conventional vehicles (IC engine based vehicles) has prompted the need to develop environment friendly alternatives. The electric vehicles industry is forecast to experience high growth prospects owing to increasing customer demand for less operational & maintenance cost as compared to fuel powered vehicles. This in turn is predicted to pose a challenge to global automotive filters market size over the forecast timeframe. Regular replacement is likely to result in increased fuel mileage by about 14%. Moreover, replacing a clogged air filter may potentially amplify acceleration by 6% to 11% on fuel-injected vehicles. In addition, these products exhibit potential capability for gas mileage enhancement and also help in reducing emission. Ability to block dirt, debris and contaminants from entering into fuel lines accompanied by high stable fuel performance and economy offered is predicted to fuel automotive filters market demand. Growing innovation along with rising customer demand for additional functions has spurred automotive filters market size. Favorable regulations and support from environmental associations such as EPA and CCC is expected to favorably impact growth. Automotive Air Filters Market size is forecast to continue its dominance and is estimated to grow at 7.8% CAGR from 2016 to 2023. Growing health disorders due to contaminated cabin air along with rising awareness regarding good quality air is predicted to fuel automotive filters market demand. Fuel filters market is forecast to grow around 10.5% CAGR from 2016 to 2023. Increasing demand for passenger cars and two wheelers particularly in BRICS countries is likely to drive the segment. Increasing health concerns among the global population coupled with growing pollution rates is also likely to positive influence consumption. Growing awareness levels regarding the importance of oil and fuel filtration for longer life span of the automobile are among other drivers. Strong technological development and innovation landscape for filtration media is also responsible for expected growth across the industry. Passenger car segment accounted for over 50% of the overall automotive filters market share in 2015. Rising consumer disposable income is forecast to drive passenger cars demand. Furthermore, rising health disorders due to improper cabin ventilation is predicted to positively impact demand over the forecast timeline. Two wheelers are forecast to grow over 8.5% CAGR from 2016 to 2023. Growth in the sector can be attributed to rapid growing demand for two wheelers from emerging countries such as India, and China. Considerable aftermarket for these vehicles in BRICS countries will also propel growth. Aftermarket automotive filters market was valued at 3.71 billion in 2015 and it is estimated to account for over 70% by 2023. Growing demand for replacement filters is expected to act as a favorable factor for automotive filters aftermarket. OEM segment is projected to experience considerable growth prospects in the coming years. Concerns regarding the installation of aftermarket products is the key driver for this segment. While OEM products may offer advantages such as elimination of warranty issues and potential quality or construction problems, opting for an aftermarket installation ensures the usage of accurate filtration media, and thus higher efficiency. Asia Pacific accounted for over 45% of the global revenue, and will grow at 9% CAGR estimations from 2016 to 2023. Growth in the automobile industry in countries such as China, India and Japan is expected to drive demand. Europe automotive filters market share is projected to be valued at over 2 billion by 2023. The presence of stringent environmental regulations will provide a fillip to the regional industry over the next seven years. Additionally, high degree of awareness, OEM product demand, and higher automotive filter market price trend will drive sales estimations. Since these products protect the vital internal engine parts from surplus wear and damage by providing abundant air flow, they improve engine performance. They are required to be replaced after every 12,000 miles to 15,000 miles. The U.S. automobile sector is characterized by growing electric vehicle demand; these cars do not require replacement products. However, the cabin air filters market will remain unaffected since these need to be installed in electric vehicles. Key industry players contributing to global automotive filters market share include Mann+Hummel, Denso, Mahle, Cummins, Lydall and Ahlstrom. Few other prominent participants include Parker Hannifin, K&N Engineering, Toyota Boshoku and Roki. Frequent mergers & acquisitions describe the global competitive scenario. In February 2014, Vokes Air, a Sweden based company that produces and distributes air filtration systems was acquired by Mann+Hummel from The Riverside Company. In August 2015, the company acquired Affinia Group, further strengthening its position in the filtration industry. Mahle has also been entering into strategic alliances and mergers and acquisitions as part of its growth strategy. Oil filters are mainly used to remove containments from transmission oil, engine oil, lubricating oil, or hydraulic oil. These products play crucial role in internal combustion engines in off-road & on-road motor vehicles. Furthermore, vehicle hydraulic systems, such as automatic transmissions and power steering are often equipped with these filters in order to offer flawless functionality. Major product types include mechanical, cartridge and spin-on, magnetic, sedimentation, centrifugal, high efficiency (HE). Fuel injected vehicles employ pleated paper air filter component in a flat panel form. It is placed inside a plastic box that is connected to the throttle body. Old vehicles that used throttle body fuel injection or carburetors use cylindrical air filter, usually between 6 inches & 16 inches in diameter. Filter media holds the fiber material and is the most integral part in the overall performance of any system which includes air handling unit and choosing the right media to maintain the pressure drop, efficiency and longevity. It is most commonly used as a replacement and as reloadable filter frames.